Discussion in 'The Cesspool' started by Woody1, Jun 12, 2017. 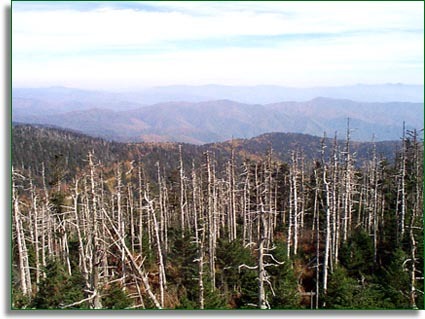 "Balsam woolly adelgids have destroyed about 95% of the Fraser firs in the Great Smoky Mountains National Park, creating "ghost forests". " It's caused by an insect (link). If you have a point to make in this thread, get around to it. No, really, what is this fallacious thread leading toward? You are missing the forest for the tree... if that little bug killed the fir trees, why is the rest of the plant life dying as well? What is preventing the nutrient uptake needed by the groundcover foliage? Oh, right, acidic rain. He is attempting to use the fact that scientists got something wrong as evidence as to why we should ignore all science... as you said, it is fallacious to the extreme. You didn't bother reading your own links, did you? That was in the link for the Balsam Woolly Adelgid which you provided. In other words, the acid rain and pollution have made the trees more susceptible to the little insects, increasing the damage. No acid rain, the trees would have been healthy, and not susceptible to said insects. 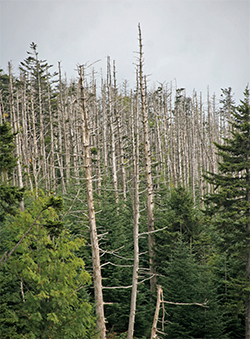 It isn't just "acid rain" destroying the trees and weakening them, leaving them prone to insect attacks. It is general pollution in the air and ground water, that is seeping into these trees, stunting their grown and basically damaging them, which then leaves them prone to things like insect attacks. Unless of course you are going to claim that you do not believe in pollution damaging plant and wildlife as well as denying climate change? I am curious though, how is it that you took the leap from pollution damage on forests to denying climate change? Is it because the "ranger" you spoke to, who we do not know is a ranger or not, said it was the insects and not "acid rain", while ignoring the fact that the pollution had weakened the trees, leaving them prone to attacks from insects in the first place? I mean, that was even in the link you provided..
Now I can't to call you names - boiling frog. The boiling frog is a parable describing a frog being slowly boiled alive. The premise is that if a frog is put suddenly into boiling water, it will jump out, but if the frog is put in tepid water which is then brought to a boil slowly, it will not perceive the danger and will be cooked to death. The story is often used as a metaphor for the inability or unwillingness of people to react to or be aware of threats that arise gradually. I once believed the same as yourself. Actually I was quite angry about those tree-killers polluting our forests, and I felt helpless about acid rain, and I was blaming the wrong person. Why not make a real difference and plant chestnut trees (link)? I plant native american trees myself. I was thinking about climate change, not acid rain. When you take out the backbone of a forest, it changes everything. Political science is not real science. It is caused by an insect (link). The climate is always changing and so is science. I trust that science has a good understanding when it can accurately predict something. I have a friend who was once diagnosed with cancer, but after investigation it was found he didn't have it after all. Therefore cancer does not exist. What if the doctors screened you for cancer, and they found acid rain instead? Then you died. Are these chestnut trees native to that specific area? Seeing that there are none in that forest, I am going to hazard a guess and say the answer to that is no. Which begs the question, why would you deliberately throw out the ecology of the area by introducing another completely different species of trees? It's bad enough that the pollution damage has nuked the trees and the undergrowth to such an extent that it has opened the trees up to infestations from invasive insects, and nuked the undergrowth, which has resulted in other species reliant on those trees becoming endangered.. You think introducing a different species of trees altogether is going to make "a read difference"? Well yes, it would, you would completely destroy the ecology of that area and the balance that exists.. And that is not a positive thing, but is instead, a very very bad thing with bigger repercussions overall.. It would help if you actually read the links you provided, which say that pollution damage made those trees vulnerable to attacks by invasive insects and it would certainly help if you stopped repeating the same thing over and over again, because that just becomes trolling.. This thread is closed for insistent fallacy, namely non sequitur derived in a context of proof by example. (1) It does not follow that "climate scientists" are somehow wrong because a park ranger says insects instead of acid rain any more than "doctors" are somehow wrong because a death certificate says "lung cancer" instead of "cigarette smoking". I'm saying we need to get the politics out of science. Is that fair enough? After all, trying to "get the politics out of science" by insisting on fallacy instead of science is the sort of self-defeating behavior that is, in fact, also self-evident. Thread closed and transferred to the Cesspool.